FCC Gives Initial OK To New Internet Traffic Rules : The Two-Way The rules could set standards for Internet providers to create paid priority fast lanes on their networks. Public comments on the proposal are due by July 15. Demonstrators protest outside the Federal Communications Commission Thursday. The agency voted to open new proposed rules for public comment, including a discussion of whether "paid prioritization" should be banned. New rules for how Internet traffic is governed were officially unveiled and approved for public comment following a 3-2 vote Thursday by members of the Federal Communications Commission. The Associated Press notes that the new rules "could set standards for Internet providers who wish to create paid priority fast lanes on their networks." "This proposal does not provide or mandate paid prioritization," FCC Chairman Tom Wheeler said at a news conference this afternoon. He said that it only asks questions about paid pathways, instead of authorizing them. The briefing was contentious at times, with Wheeler growing frustrated by what he called overly hypothetical questions. "I buy a pipe, I buy a pathway," Wheeler said, using his own arrangement with his Internet provider as an example. "Nobody can mess with that." He added, "I'm saying there's a path to the Internet — I bought it!" The commission's 3-2 vote this morning had its Republican members voting against and its Democrats voting in favor (see the proceedings in archived video at C-SPAN). Asked by a reporter about a "rift" between the commissioners, Wheeler said, "Everybody got it three weeks early. There were a couple of early 'noes.' "
He also said he has "a hard time associating myself" with comments made by Republican commissioners at today's session. While several protesters announced their presence at the meeting, FCC special counsel Gigi Sohn tweeted, "no protesters were arrested during #NetNeutrality presentation. They were simply escorted out of the room." The FCC hasn't yet released the full text of the proposal, which was prompted by Wheeler's proposal for an Open Internet in February. The agency handed out a guide today to what it calls "Protecting and Promoting the Open Internet." The guide was then posted online by Alex Howard of the blog E Pluribus Unum. The document says the proposal "asks whether paid prioritization arrangements, or 'fast lanes,' can be banned outright." It also asks "whether broadband providers should be required to disclose specific network practices, performance characteristics (e.g., effective upload and download speeds, latency and packet loss) and/or terms and conditions of service to end users (e.g., data caps)." Washington Post tech writer Brian Fung, who has followed the net neutrality issue closely, tweets, "yes, there may be a fast and slow lane. But the FCC says consumers will effectively choose how slow 'slow' means." That idea is the crux of Fung's story for the Post, which cites Wheeler's statement during today's hearing that "If a network operator slowed the speed of service below that which the consumer bought, it would be commercially unreasonable and therefore prohibited." 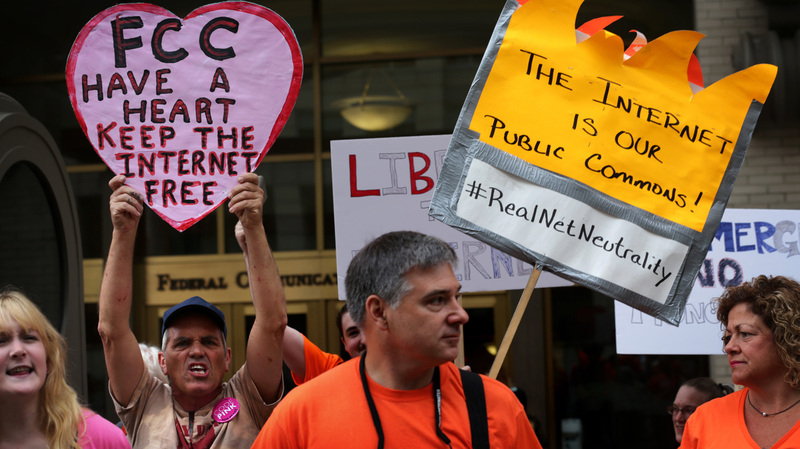 The net neutrality issue has been lobbied heavily by industry and consumer groups. Public comments on the proposal are due on July 15. The FCC has posted a link for people to use to email their input on its "Open Internet" proposal; a Web page explains the full process. "FCC Chairman Wheeler says he is dedicated to making certain everyone's content gets to consumers without interruption; but an initial version of the proposed rules suggested it might be OK for Internet service providers like Comcast to charge a content producer like CNN extra if it wanted to reach viewers faster." In a nod to the intense public interest in the question, Commissioner Mignon Clyburn said in a round of speeches before the vote that even her mother had gotten in touch about it. "When my mother calls with public policy concerns, I know there's a problem," she said. Clyburn went on to lay out the issue and to say that American consumers will have a chance to weigh in on the proposal. "I support an open Internet," Commissioner Jessica Rosenworcel said. "But I would have done this differently." Saying that the Internet is now a powerful force in Americans' lives, Rosenworcel said the rules change was contemplated without enough input. Some commissioners, such as Ajit Paik, announced their dissent before the vote, stating, "I respectfully dissent." Commissioner Michael O'Rielly sought to eviscerate the rules notice, saying its flaws include a lack of cost-benefit analysis. He said the proposed net neutrality rules would stifle creativity without providing any benefit to consumers. After O'Rielly spoke, the proceeding was briefly interrupted by a protester who yelled, "I speak on behalf of the Internet generation!" She continued to speak, calling for a free and open Internet, earning applause from some of those in attendance. Before the vote, FCC Chairman Tom Wheeler said that the rules proposal needs to be judged on its content, not on the rumors that have circulated. He also sought to allay concerns that the new rules would create a "fast lane" and a "slow lane" online. "Nothing in this proposal authorizes paid prioritization," Wheeler said, "despite what has been incorrectly stated today." Noting that previous efforts to change the Internet's rules had been blocked in court, Wheeler said that the FCC is moving "to surmount that opposition."